Welcome to North Coast Creations March Release! This month, North Coast Creations is releasing three coffee themed stamp sets! Continue reading below to find out how you can win one of two North Coast Creations $10 Gift Certificates good towards the purchase of NCC Stamps. I'm sharing two projects today, using two of the sets from the NCC March Release, along with Custom Dies, and a paper collection from Our Daily Bread Designs. 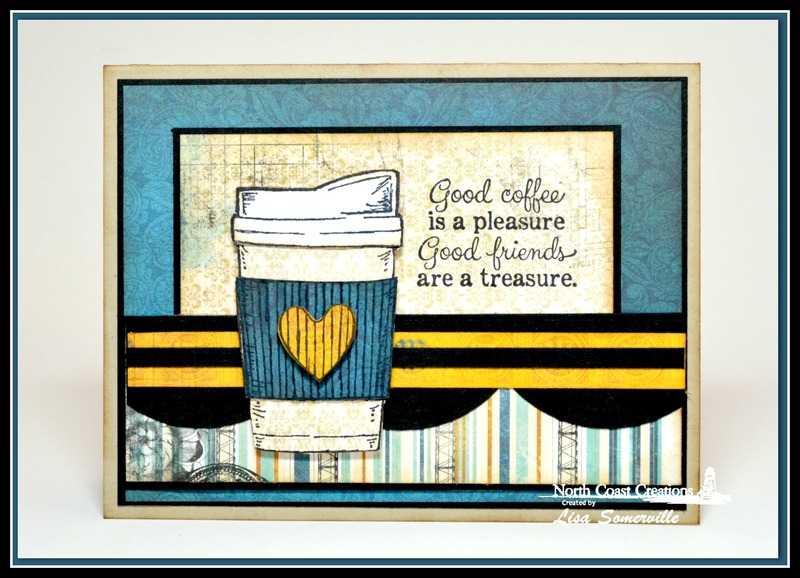 Both of the cards I created use paper Paper Piecing Technique and the Coffee Cup from the Warm My Heart stamp set. I had fun mixing the patterns from the ODBD Patriotic Paper Collection to create this first card. 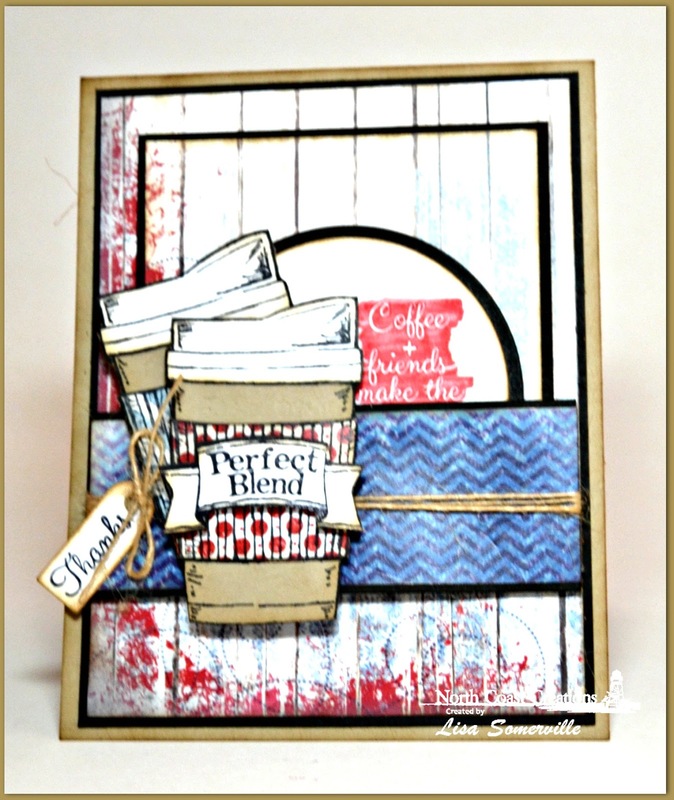 The sentiment and "perfect blend" are from the What's Brewin'? stamp set, while the "thanks" is from Warm My Heart stamped on a White panel and die cut using the ODBD Custom Mini Tags Dies. Stamps - North Coast Creations Warm My Heart, What's Brewin'? To add a little texture to the coffee cup wrap and heart, I ran them through the Crimper. Two randomly selected winners will each receive a $10 gift certificate to North Coast Creations, good towards the purchase of NCC stamps, just for commenting on the Design Team cards! You have until March 27, 2015 at 10:00 PM EDT to leave a comments on the participating designers blogs for a chance to win! Winners will be posted March 28th, on the North Coast Creations Blog, so be sure to check back there to see if you are one of the winners! Both are awesome! Love the clever way you combined the sentiments on the 1st and I love the colors on the 2nd! HUGS!! Really great projects and it looks like a great release too! very cute projects!!! love the colorfull of both. Love both of the cards. I especially like the color combo on the second one. both are great samples, Lisa! love the first using the Patriotic paper and double cups!!!! Super cute cards. I love the polka dots and wood background on the first one. And the yellow and blue combo on the second looks so fun and fresh. Great card designs and choice of papers. Love the card with the rustic wood background. Both cards are adorable! Oh Lisa your cards look so nice! I love how you use patterned papers on a card. This release is so fun and pretty. Thanks for the inspiration! Hugs, Gracie. Both of these cards design are great, especially the colors on the second and the clever sentiment combo on the first. Thanks for sharing! Both are wonderful, Lisa! Love the colors and matting on each. So eye catching!